Picture yourself at work, walking into a room a full of drums. There is one drum for each person on your team. You get to spend the next 45 minutes making music, laughing, and being playful. Your team members leave relaxed, uplifted, and smiling. The scenario you are envisioning is what a corporate drumming event might look like in your workplace. 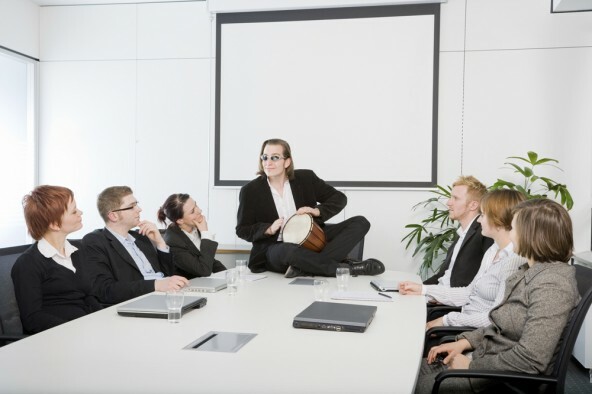 The idea of drumming in the workplace sounds like fun to some people, yet also they may see it as a form of entertainment with very little teambuilding or wellness value. In my experience, drumming can be entertainment, team building, and an effective wellness activity simultaneously. The key is being clear about your goals with the drum circle facilitator that you hire. According to a study done by Dr. Gary Bittman, economic analysts (independent from the research study) estimated that a Pennsylvania corporation saved $89,100 in expenses for training new employees through having corporate drumming events to improve the company culture & morale. The return on investment was $60.57 saved for every single dollar invested in drumming. As an ice-breaker for an event, drumming is a fantastic form of entertainment.Regardless of diverse musical tastes, most audience members can appreciate a good strong beat. Drumming resonates with everyone. After performing with a drum group as an ice breaker at events for Pharmacia & Upjhon (now Pfizer) and Forest Laboratories, I have witnessed audience members wake up and get happy really fast. Throughout the event, employees would come up to us and thank us. The drumming clearly set the tone for the day. It never fails. In a wellness drum circle for your team, it's so much more than just jamming out...although that is part of it. The ability for your team to play a steady rhythm solely depends on their ability to work together and practice one of the most difficult skills necessary for success: LISTENING! In my experience, a drum circle is reflective of what happens in our social lives. You have loud people that always try to dominate the groove, quiet people who are shy to play, and everyone else. Through empowering the loud people to quiet down and blend in, while the shy people speak up more (musically), your team will sound like a solid drum band in a few minutes. Most importantly, they will feel a profound sense of unity and pride, as a team. According to the late Dr. Steven R. Covey, the author of The SPEED of Trust: The One Thing That Changes Everything, "success in business requires two things: a winning competitive strategy, and superb organizational execution. Distrust is the enemy of both. "A willingness to become vulnerable will allow people to trust each other. When people trust each other, they become playful. Drumming creates a safe environment for adults to be kids again and express their creativity. Depending on your goals, a drumming event in your workplace can be entertainment, a team building exercise, or an effective wellness activity. It can even be a combination of all 3. It's important to clarify your expectations with the drum circle facilitator you choose to hire. Happy Drumming! Mike Veny is a compelling speaker and drumming event facilitator, sponsored by Toca Percussion. He delivers entertaining, engaging and educational experiences to companies throughout the world. Mike is a member of the National Speakers Association, the Global Speakers Federation, Toastmaster's International and Meeting Professionals International.